I set up this blog over a year ago and I haven’t posted or updated it since that time. The reason I originally set up the blog was because I wanted to provide a portal to links documenting the many stories , experiences and news articles about Seroxat and also to bring awareness to the dangers of the drug. I had a terrible and painful experience with the drug myself and I hoped that upon discovering the information provided here , others could be spared the same fate as me. My fate being; a torturous 4 years on Seroxat which not only cost me my sanity at the time but also my mental, physical and emotional health. It took me some years to recover from a full blown withdrawal and the side effects still lingered long after my last toxic dose. I think Paroxetine (Seroxat-Paxil-Aropax) is one of the most dangerous chemicals ever created for human consumption and I think it is high time this medication was withdrawn from the market. It is astounding that it is still available as an “option” for depression and anxiety because as is evident, the case against its efficacy and effectiveness has long overwhelmed its purpose. Seroxat is lethal, and Seroxat should never have been licensed. The sheer volume of information which has come out about Seroxat in the 18 months since this blogs creation is staggering. However, it is also heartening and inspiring to see more blogs and videos about Seroxat appearing on youtube. More brave voices are being heard and It seems the seroxat sufferers did indeed begin to “stand up and be counted”. This blog has had tens of thousands of hits in 18 months (the others much more, as far as I know) , and it is interesting to note also that GSK regularly monitor all of the blogs that I am aware of. It never ceases to amaze me just how widespread the Seroxat Scandal became and how many thousands of people’s lives have been negatively affected by Seroxat. It is also shocking to know that this drug is still being prescribed, not just to current addicts of the drug but also to “new users”. The Case against the current sale and promotion of this SSRI antidepressant is blindingly obvious and has been for years. The only solution to the current Seroxat Situation is a gradual banning of the Drug. It should be gradually withdrawn from pharmacy shelves and those currently unable to wean should be guided into a monitored tapering regime. It should not be prescribed to new users and it should eventually be banned from sale. It is defective and dangerous and it has destroyed countless lives. LONDON: A British regulatory agency said Thursday that it will not prosecute pharmaceutical company GlaxoSmithKline for allegedly withholding data on clinical trials of Seroxat, an antidepressant drug. Clinical trials have indicated that people under age 18 who took the medication had an increased risk of suicide. The Medicines and Healthcare Products Regulatory Agency, announcing the conclusion of a four-year review, said Thursday that there was no reasonable prospect of a conviction in the case. “The legislation in force at the time was not sufficiently strong or comprehensive as to require companies to inform the regulator of safety information when the drug was being used for, or tested outside its licensed indications,” the agency said. The drug was only licensed for adults. Glaxo handed over data from clinical trials in 2003 which indicated that patients under 18 had a higher risk of suicidal behavior if they were treated with Seroxat compared to those receiving a placebo. The research also indicated that Seroxat was ineffective in treating depressive illness in under 18. Andrew McCulloch, chief executive of Britain’s Mental Health Foundation, criticized the agency’s decision. “It is totally unacceptable to hear that, when information can be made available at speed, young people may have taken their own lives due to a lack of transparency by a pharmaceutical company,” McCulloch said. Kent Woods, the agency’s chief executive, said he was still concerned that Glaxo “could and should have reported this information earlier than they did.” “This investigation has revealed important weaknesses in the drug safety legislation in force at the time. Subsequent legislation has partially addressed the problem, but we will take immediate steps to ensure the law is strengthened further, so that there can be no doubt as to companies obligations to report safety issues,” Woods said. So, after 4 years of investigating GSK, the MHRA decided not to prosecute because of “insufficiently robust laws” , which means that basically GSK were let off the hook because of a “loophole”. Children died because of GSK suppressing negative data and inflating the positives of their pediatric seroxat study , the infamous “study 329”, and does justice come? . No, it does not. It is not surprising to me that GSK were not prosecuted in the UK. They operate within a status in England which could only be described as “above the law”. They are a UK company and they contribute huge revenue to the UK economy. They have their monetary tentacles in almost every facet of the British health system, from pharmaceutical research, regulatory affairs , sponsorship, universities, grants, scientific discovery , patient groups to corporate advice to the UK government. They are a certifiable English institution which provides a lot of employment and their stocks and shares are insidiously intertwined with the UK economic system. Their sphere of influence is huge in the UK and it is also very powerful. Personally I think the UK failed to bring criminal charges against them because they dare not bite the hand which feeds them. It will be interesting to see how the scenario plays out in the US, they have power there too, but nowhere as close to what they yield on their home turf of England. Maybe the case against Paxil (Seroxat) there will be very different? Is GSK above the Law in the US? Or do the American authorities perceive GSK as an arrogant foreigner who dares to commit corporate crimes on American soil? The answer remains to be seen. As we can see, there are many questions which still need to be answered about Seroxat. GSK was under pressure from the UK regulator to reveal the truth about Seroxat in the UK, but they say because there was no chance of a conviction , they could not file criminal charges. Personally I find it strange that the UK authorities failed to secure a criminal conviction. Surely they would have known from the very beginning that GSK would have used the “loop” hole to get off? Why did they investigate GSK for four years if there was no possibility of a conviction? What documents did they find and who were the witnesses that refused to be interviewed? And why were they not forced to be interviewed? It was after all a “criminal investigation”. Some people might interpret the outcome as another “cover up” by the MHRA. Some might perceive it as a “white wash”. Personally, I am not sure, all I know is my instinct tells me that something stinks about the whole thing. I can only imagine how the families of people who committed suicide in a “seroxat induced-lapse of reason” feel. Disappointed , angry and let down again, I would imagine. We can only hope that the US authorities do not fail in their investigation of Seroxat (or Paxil, as it is called in America). People need closure. And they deserve it. There are some interesting points raised relating to the GSK Seroxat investigation in the UK, they are contained in a letter from Kent Woods (MHRA CEO) to (ex) GSK CEO , JP Garnier and the subsequent reply by a representative of the company. It is clear that Kent Woods is far from satisfied with GSK’s conduct regarding the submission of Data about Seroxat harming children. It is also obvious that he is on some way rebuking JP Garnier and offering him the chance to possibly redeem the company by releasing all the data into the public domain. The letter from Kent Woods did receive a response, but it is far less interesting, and also in typical GSK style it was more of a standard corporate mantra and interestingly, (but not surprisingly) Garnier did not reply personally. Basically what GSK is saying here is , if you ask for specific information about the Seroxat criminal investigation we “might” give it to you. But how is the MHRA supposed to know what to ask for when it does not know what the documents are? Again, it seems that GSK have bamboozled the MHRA, and personally I think the only transparent thing about this exchange is the weakness of the MHRA and the arrogance of GSK. On the Subject of “revelations” , amongst the many interesting news which surfaced about Seroxat this year was Dr Peter Breggins testimony. According to Breggin, GSK duped the FDA by doctoring the original clinical trials before submission for a license. I had known for years about GSK manipulating its data and had attempted without success to get the FDA to acknowledge and to examine the problem. I originally discovered the shenanigans eight years ago when I was examining the secret files of GlaxoSmithKline (GSK) as a medical expert in a product liability suit against the company. California attorney Don Farber and my assistant Ian Goddard accompanied me. The suit was brought by the family of a man named Lacuzong who had drowned himself and his two young children in a bathtub a few days after starting to take Paxil. He had no previous history of violence or suicidal thoughts. As I went through the hundreds of boxes of materials packed into a large room in the GSK company headquarters, I came upon something remarkable. GSK had managed to hide that Paxil was causing an increased rate of suicide attempts compared to placebo. The company jacked up the number of suicide attempts in the placebo group, until it looked more dangerous to take placebo than to take Paxil. In reality, there were more suicide attempts among the patients taking Paxil. I wrote a lengthy report charging the company with negligence in the development and marketing of Paxil and it was submitted to the court in 2001. Despite attorney Don Farber’s best attempts, the court refused to unseal the data, even though it disclosed a public health threat of suicidal behavior induced by an antidepressant drug that was being prescribed to millions of unsuspecting citizens. The case was settled for a substantial amount of money without GSK admitting any negligence, and the smoking-gun files were kept secret. Nonetheless, I wrote about my findings and even told the FDA about the manipulated data when I addressed the agency’s panel on two occasions at its 2004 hearings on antidepressant-induced suicide. I invited the FDA to make use of my knowledge about how GSK was fudging its research findings, but the agency ignored my offer and my written reports. This was not unusual. The FDA has always failed to utilize the otherwise unavailable information gathered by medical experts, and yet it will not carry out its own investigations. A few years later I participated along with attorney Farber in another product liability suit against Paxil and GSK involving suicide. Again the case was settled to the satisfaction of the plaintiffs without GSK admitting any wrongdoing. But this time the new court made public my original Lacuzong report. As a result, in 2006 I was able to write three articles about my findings in the scientific journal, Ethical Human Psychology and Psychiatry, and I put the articles along with the original Lacuzong product liability report on my website, www.breggin.com where they can still be found. The report and the articles describe many ways in which GSK managed to hide the truth that Paxil increases the risk of a person attempting suicide. This is the same information now released byTheWall Street Journal as a result of yet another expert’s product liability case report that drew in part upon my original data. To this day, the FDA continues to act as if drug company data can be trusted, including GSK’s invalid manipulation of the Paxil suicide studies. The FDA has also ignored data that I discovered in product liability suits against Prozac and Eli Lilly. Eli Before Prozac went on the market, Lilly knew that patients taking their drug had a hugely increased rate of suicide attempts compared to similar or the same patients taking placebo. Even after the British medical journal BMJ released this data, the FDA has continued to ignore it. Although this information is hardly new to those of us who have researched Seroxat for many years now, it was widely publicized this time, even the Wall Street Journal did a piece about it. What I find shocking about this whole sordid affair is not that GSK duped the FDA and the MHRA, or GSK suppressed data or GSK deceived the public about Seroxat side effects, Seroxat induced suicide and Seroxat withdrawal. All that is bad enough, but what is worse is that there has been virtually no outcry from the medical community. Where are all the GP’s, Doctors and Psychiatrists who prescribed this toxic junk? Why are they not speaking out? Why are GSK still allowed to license drugs? Why are they not shunned by the medial community? Surely, this news should cause utter condemnation from every corner of the world of medicine, why is it always the patients who have to carry the burden of bringing awareness to all this? Why is a drug which increases the chances of suicide still being prescribed to vulnerable people? News concerning an investigation into Dr Martin Keller of Brown University. Dr Keller was involved in the infamous GSK “Paxil Study 329”. It seems to me that the medical community at large has remained silent about the Seroxat scandal because the medical community is complicit also in the Seroxat Scandal. So instead of condemning it, they choose to ignore it, but like a bad smell with a stink of epic proportions , the scandal of Seroxat will not go away. Another interesting development in so far as patients speaking out about the Seroxat debacle came in the form of a meeting between Seroxat Users Group (SUG) and the MHRA. The Audio of this meeting was recorded and released into the public domain by the mental health advocacy blog “Furious Seasons”. For those interested in gaining an insight into the attitude of the MHRA and their role in Seroxat, this audio is essential listening. Another interesting audio recording which made its way on to the web from the BBC was an interview with (ex) GSK CEO JP Garnier. When asked about the Seroxat Scandal, Mr Garnier rudely abandoned the live interview and walked out of the broadcast. Read into that what you will. Personally, I gained more insight into the GSK corporate mindset from this short audio recording than I have from 6 years of researching the Seroxat Scandal. It’s well worth listening to. I won’t personally comment on this recording, I think it speaks for itself. Buy Alison Bass´ books at your local independent bookseller (booksense.com) or online fromAmazon.com. I have not read the book yet, although I am pretty sure I would be knowledgeable about most of its contents, as most of it can be found in earlier posts of mine on this blog. Actually, I could have written the book myself and maybe I should have. But anyhow, it is good to see at least some aspects of the Seroxat Scandal in book format. There has been so much news about Seroxat – Paxil so far during the last year that it is difficult to wade through, but thankfully , Bob fiddaman of “Seroxat Sufferers” has updated his blog almost daily, as has the author of “Seroxat Secrets” , so for more news stories, comment and articles relating to the Seroxat and Paxil Scandal, Please check out both blogs. 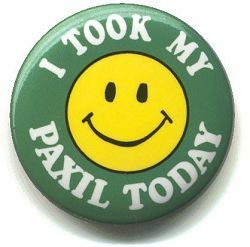 On a (almost) final note for now from me, here are some more Seroxat-Paxil related articles which I think are very relevant and worth exploring further. It is a an excellent piece of journalism and also provides a valuable insight into how GSK markets Paxil in other countries. People have said that GSK and other pharmaceutical companies market the disease before they market the drug and I think this article illustrates that concept. Whatever misgivings Ono and other doctors may have about the medicalization of mild depression, it has been a resounding financial success. As one psychiatrist, Kenji Kitanishi, noted wryly, ”Japanese psychiatry is in the bubble economy now.” Between 1998 and 2003, sales of antidepressants in Japan quintupled, according to IMS Health. GlaxoSmithKline alone saw its sales of Paxil increase from $108 million in 2001 to $298 million in 2003. According to the company, during one seven-month ad campaign it ran last year, 110,000 people in a population of 127 million consulted their doctors about depression. On the subject of Paxil In Japan, it seems that the UK, US and Canada are not the only places to experience cases of Seroxat and Paxil induced suicide. This article is from 2007. A Japanese health official says that cases involving suicide or suicidal behavior among patients taking Paxil were 13 times higher last year than in the previous year. The Minister of Health, Labor and Welfare says that approximately 920,000 people in Japan suffered from depression during 2005.According to reports by doctors to Japan’s Pharmaceutical and Medical Devices Agency, 15 patients taking Paxil committed suicide last year, compared with only one in 2005. An additional 24 patients attempted or contemplated suicide in 2006 while taking Paxil, compared with only two patients during the previous year. In addition to the possible link between Paxil and suicide, reports suggest that birth defects in babies born to mother taking the antidepressant may be another possible Paxil side effect. In 2006, GlaxoSmithKline, the drug’s manufacturer, added a “black-box” warning to the drug’s labeling in the U.S. The label was designed to warn patients and doctors of the risk of suicide in children and adolescents taking Paxil. The Food and Drug Administration issued a warning about the risk of Paxil birth defects in 2005. Despite these measures, however, neither the FDA nor Glaxo have issued a Paxil recall. Another very sad article which caught my attention this year is the case of Sara Carlin , Sara was 18 when she killed herself in Paxil induced despair. More about Sara can be read here on the blog “Death By Paxil” (by Euchred). Sara is one of many young persons who were driven to Suicide from Seroxat’s disturbing and frightening side effects. One such side effect is Akathisa, which is basically an inner turmoil and restlessness which literally drives sufferers to the absolute edge of sanity and reason. And because Seroxat also disconnects people from their minds and emotions through side effects like depersonalization and de realization for some users this proves too much to bear. Having experienced them myself, i know how this drug negatively affects the human mind and can induce a state of absolute physical and mental torture. My sincerest sympathies go to Sara’s family who were brave enough to speak out and have this letter printed in memory of their daughter. This web site was developed with the intention of bringing awareness to ordinary Canadians, and the general public worldwide, the dangers of the prescription drug Paxil ( paroxetine HCL ), as it is marketed and known in Canada, and as Seroxat in the United Kingdom (UK), by the GlaxoSmithKline company (GSK). This site is especially dedicated, in bringing attention to the deaths and damage that Paxil has caused, and continues to cause children, adolescents and young adults. It would not be necessary to develop and maintain a web site such as this if GSK was an ethical pharmaceutical company, and if our doctors that prescribe Paxil were properly educated in its risks, and did provide proper medical care and monitoring of their young patients. We truly believe that the medical community has relinquished their responsibilities to their patients, in favour of large pharma companies such as GSK. We believe that this in part due to the slick, multi-billion dollar marketing campaigns targeted toward our primary care physicians. Here is just one paragraph from the official GSK Paxil monograph (in quotation marks), a whopping 52 pages no less, describing some of the very nasty negative effects associated with this drug. And last, but by no means least ,another blog from a UK seroxat sufferer which contains links to more info about the drug, the MHRA/FDA and also petitions to the UK prime minister in relation to the drugs effects. For those of you who are currently taking Seroxat (paroxetine -Aropax -Paxil)and happen to stumble upon this blog searching for information on how to get off it or deal with side effects etc, I recommend you visit the following ” SSRI withdrawal forums” and ” Paroxetine advice websites” for guidance on how to do so safely and effectively.